During a shopping trip, i received an email from superdrug saying they had some exclusive offers on some products that was to buy one, get another product free. I thought it would be worth a look to see which products are on offer and was surprised to find there was quite a few that usually are more on the high price range were included in this offer. I decided to pick up my usual Garnier intensive exfobrusher ( a review on that product will be soon ). 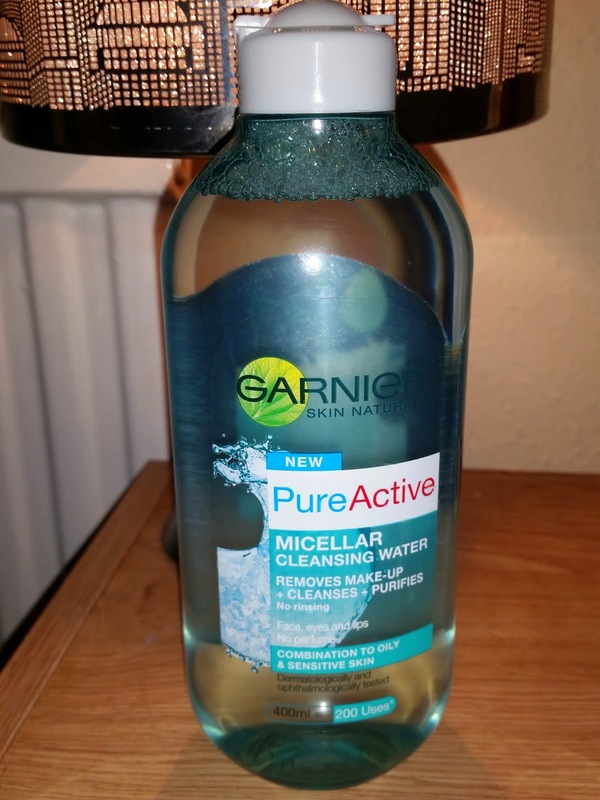 So then i picked up the Garnier Pure Active MICELLAR Cleansing Water. Having heard all the hype about the micellar water and seen the adverts i thought, well its free with the offer so why not give it a try. 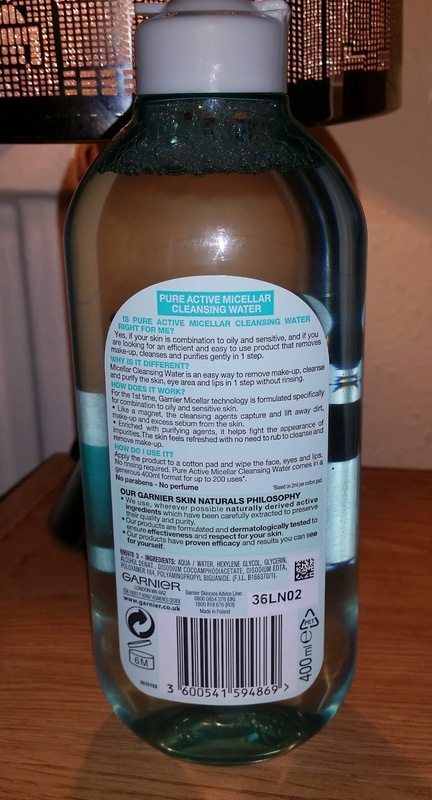 I do own a different micellar water from a different brand and that worked brill for me, but i review products on there own merits rather then setting a competition between them all. With this micellar water, Garnier has surprised me as the bottle is quite bulky and you get 400ml which states you get 200 uses. For me that was one of the appeals as you feel like your getting your moneys worth. There was many in there range that stated for sensitive, normal. combination skin. On this bottle it states combination to oily and sensitive skin which kind of ticked every box for me. Its also can be used for lips and around eyes and no perfume or parbens is in this, so thats good for the sensitive skin types. The look of this water is a pale blue colour and has a pop up lid that also snaps shut which stops leakage. make-up, cleanses and purifies gently in 1 step. cleanse and purify the skin, eye area and lips in 1 step without rinsing. For the first time Garnier micellar technology is formulated specifically for combination to oil and sensitive skin. *Like a magnet, the cleansing agents capture and lift away dirt, make-up and excess sebum from the skin. What i like about Garnier is that they tell you some informative information so you know your not putting tons of chemicals on your skin. Also there products are dermatologically tested. So after a hectic day, i reached for this big bottle and the Cotton pads and was amazed at how refreshing it felt to swipe this over my skin. It was taking away all the daily stresses of that day and helping my skin breathe! My skin felt refreshed and clean without it feeling like some sort of paint stripper had been used and all the moisture has gone. This has the perfect balance of taking away the bad but leaving the good! So the hype is true about this, if your looking for a micellar water then i highly recommend this one! This retails as £4.99 at superdrug but for the size you get it doesn't leave you with a guilty conscience over spending money! I'm sure if you have a look around, this will be on offer somewhere or be part of a deal.